Are you an SME working in the agri-food sector in Greater Lincolnshire? If so, we have exciting news for you. We are pleased to announce that a project will be starting soon aimed at helping stimulate agri-food technological innovation and provide underpinning support for the technical, economic, and environmental performance of Greater Lincolnshire’s largest industry sector (agri-food). Led by the University of Lincoln, in partnership with the Grimsby Institute Group, and supported by funding from the European Regional Development Fund (ERDF), the project will deliver applied research, innovation, knowledge and demonstration activities. This project combines the resources of the University of Lincoln’s Lincoln Institute of Agri-Food Technology (LIAT), the National Centre for Food Manufacturing (NCFM) at Holbeach, and the Grimsby Institute’s Food Refrigeration and Process Engineering Research Centre (FRPERC). GLAFIP therefore creates a multi-centre innovation hub that is ideally positioned to serve the needs of all of Greater Lincolnshire’s agri-food businesses. ★Applied research which helps take research led ideas closer to the market. ★Knowledge Exchange and Knowledge Transfer between primary producers, food manufacturing companies, end users, technology suppliers and the research base to assist collaborative working. ★Training events, workshops and demonstration facilities to assist new technologies to reach commercialisation. 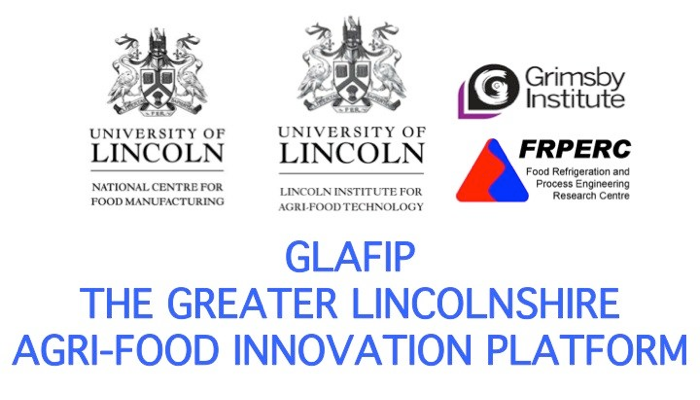 The GLAFIP project is offering FREE, one-to-one support for Small to Medium Enterprises (SMEs) within the agri-food supply chain in the Greater Lincolnshire region looking to become innovators and improve their business sustainability. The support provided will be unique to each individual business, meeting their specific requirements. A range of projects with businesses will be supported from 2 day projects to more in-depth business partnered projects lasting 12 months or more. An initial consultation meeting will detail the support available and align the business with the correct specialist who will then work as a dedicated adviser to that business. This project is focused on facilitating the translation of knowledge into practical solutions, which can then be commercialised into new products and services, and subsequently promoted across the agri-food sector. If you would like more information regarding this project, please contact us.